Two astute businessmen talking shop. This entry was posted on Monday, 22 July 2013 at 12:05 AM and is filed under Contributions to the World, Cool, Music, Retro, True Stories. You can follow any responses to this entry through the RSS 2.0 feed. You can leave a response, or trackback from your own site. 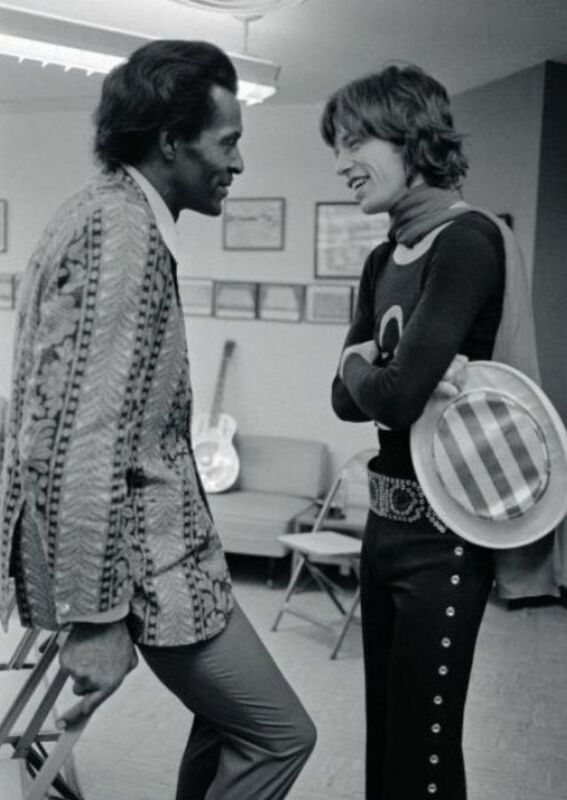 I heard somewhere that Chuck Berry gave Keith Richards a black eye after an ill-advised tap on the shoulder. Looks like he likes Mick. He does not like Keith, it seems. Apparently they’ve had a few awkward encounters over the years. An interesting story I heard about Chuck Berry is that, still to this day, when he plays a show outside of St. Louis, he travels alone with his guitar and an empty briefcase. When he arrives at the airport, he rents a car, drives to the venue where his hand-picked backup band awaits him. (He has a different band in each city.) Once there, he presents the empty briefcase in order for it to be filled with cash. If the promoters do not provide the agreed amount, he gets back in the car, drives back to the airport and flies home. Chuck Berry was great, but he kinda hit the wall with “My Ding-a-Ling”. Chuck Berry was a pioneer of Rock-n-Roll in more ways than one. While his contemporaries (like Bo Diddly and Little Richard) were screwing themselves out of royalties, Berry figured it out. He eliminated having to pay a backup band to tour with him, avoided all the logistics/ego problems by hiring a local bar band. Bruce Springsteen was in one of those bands, and before the show asked Berry what they were going to play. “Chuck Berry music” was the response. By the 1970s, anyone not familiar with the CB Playbook was out of luck, at least as far as Berry was concerned.